Backup with FTP is a very simple way of backing up your website files. computer (usually your own) to a live server (web hosting). To backup with FTP you will need to download and install a FTP software program. We recommend a program called FileZilla. 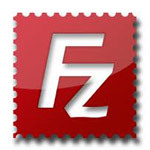 FileZilla is free software and has a great reputation, I have been using it for years!! Firstly, we need to access the hosting server by entering in our FTP login details. The FTP login details will be sent to you via an email once you have paid for your website hosting package. Now we will backup with FTP and make a copy all the files in your website to your computer.